Implements a platform-independent mutex–for serializing access to a shared resource. Constructor. Creates a mutex object that can be used to serialize access to a shared resource. Destructor. Destroys the mutex object. Used by the Wait class to test whether the mutex is free. Lock the mutex. Attempts to lock the mutex. There must be a matching call to Release for every call to Lock. _bWait Defaults to true. Set this argument to false if the method should return immediately, even if the lock is not available. True if the lock was obtained. 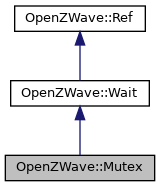 Releases the lock on the mutex. There must be a matching call to Release for every call to Lock.